Each one is hand made from recycled pine boards and has plexiglass sides to allow you to see the money inside. Wooden pegs are used as highlights. The coin slot is on the top and the coin remove plug is on the bottom. They can be any color you choose your bank to be. 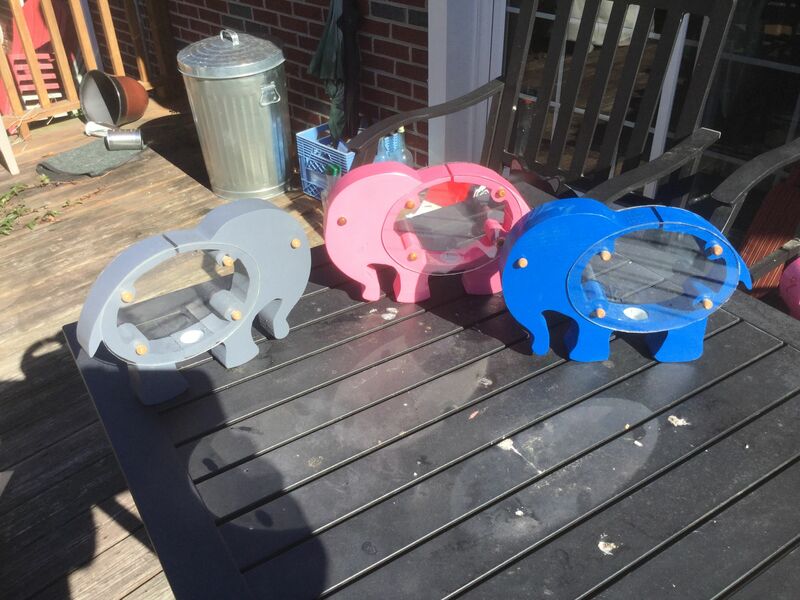 I will only need a few days to build any color them you desire. Of course no bank catalog is complete without the classic piggy bank. Each one is hand made from recycled pine boards that I laminate together to make the bank. The coin slot is on the top and the coin remove plug is on the bottom. They can be any color you choose your bank to be. I will only need a few days to build any color them you desire. 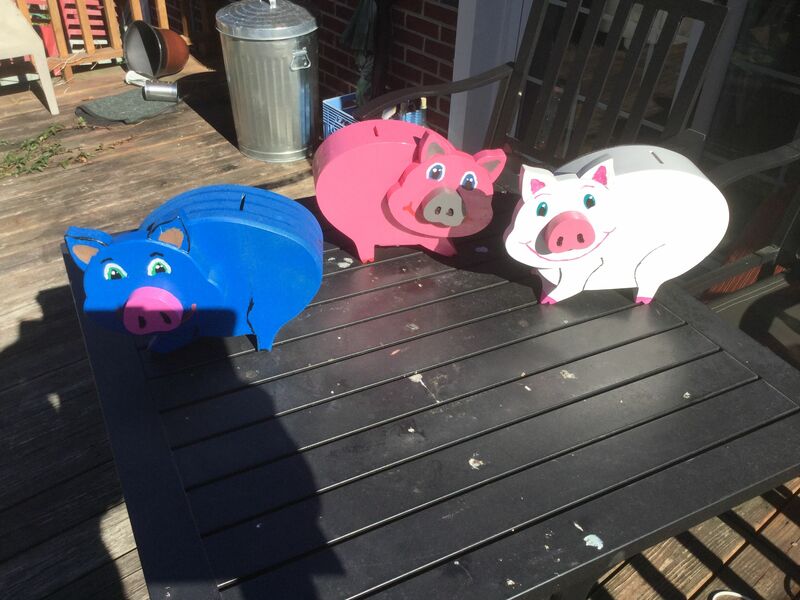 The head is hand made from a 3/4′ board and is hand painted to make the distinctive personality of each little piggy. I can paint their eyes any color and can make the her look right or left. 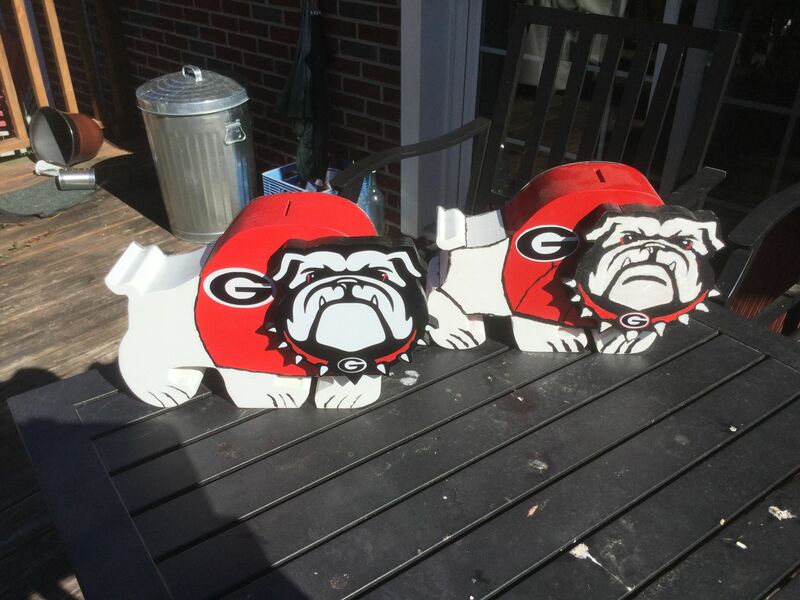 UGA’s body is made from four 3/4′ boards laminated together. His head is another board that I cut out and hand paint before laminating it to the body. I made the design from a cartoon character dog (Spike) that I made. 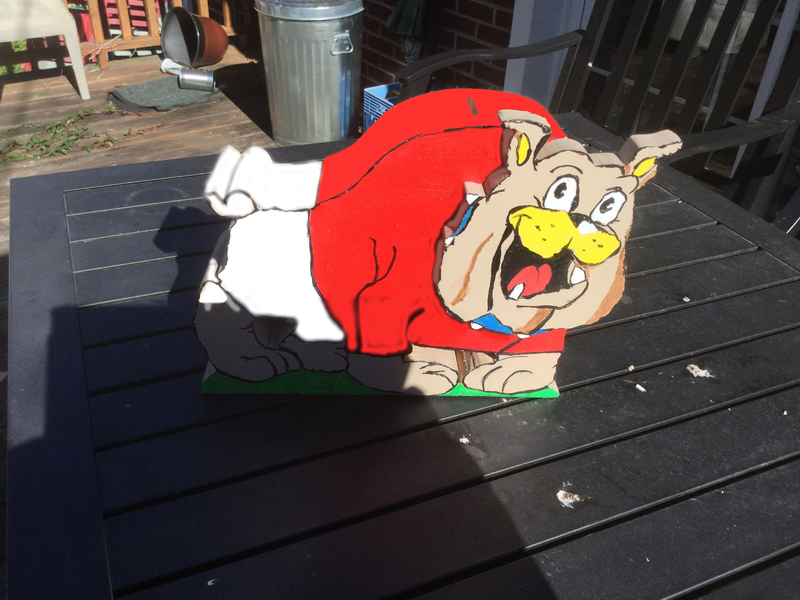 The bulldog head is cut and painted to resemble the University of Georgia mascot logo. The coin slot is in the top and the coin return is between his front legs on the bottom. I can make his solid , or can make the rear clear so you can see the coins inside. The price is the same. The “G” on his collar and on his sweater are made from vinyl that I cut and assemble by hand. His feet are hand painted also to look as if he is staring toward you. I also made him into a lamp instead of a bank by eliminating the coin section and adding a lamp to him. Spike is a cute character that any kid will love, no matter the age of the kid. In fact, the kid who wanted me to make the first one is 43 years old. He is made from four 3/4′ boards laminated together. His head is another board that I cut out and hand paint before laminating it to the body. His coin slot is on his back and his coin return is behind his head on the front. Spike’s head is hand made and painted to look somewhat like the cartoon character. A lady looked at the elephant and piggy banks and asked if I could make her an owl bank. Of course I can’t turn down a good challenge, so I designed the Owl family. I make them in three sizes. 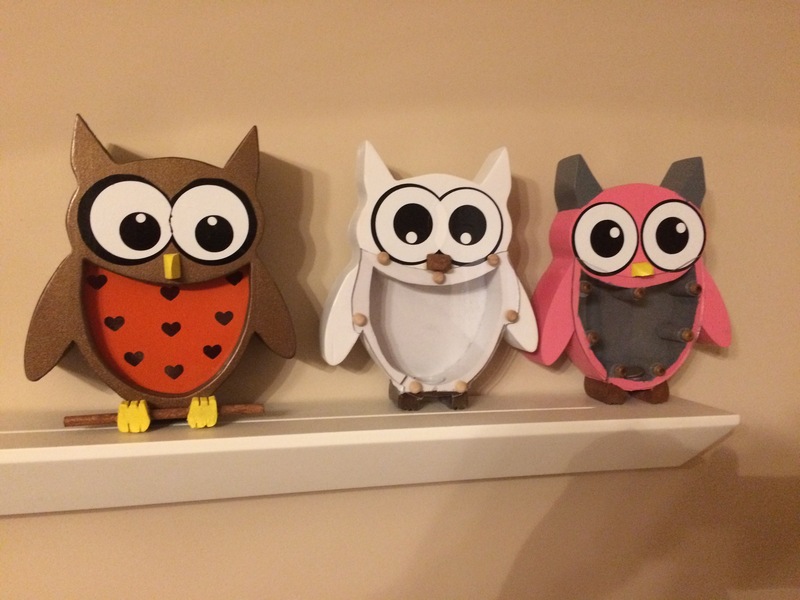 Daddy Owl is made from three laminated boards. Mama and Baby Owl are made from two boards laminated together. They have a hollow front to allow you to see the coins. Daddy Owl is shown with hearts on his stomach plexiglass. His ‘glass’ is inset to give him a much larger look. All have vinyl eyes that I make myself and a goofy beak. There are no two alike since I make each by hand, down to cutting the feet. All are completely hand made and hand painted, so there are ‘character’ flaws in the wood and paint from time to time. That makes each on totally unique. I also make Owl Clocks by putting clocks inside the owl instead of a coin area.